Keith Stoeber Network Administrator, Sioux Central, USA "Not only does the internet feel faster, but CACHEBOX allowed me to better understand our network traffic"
Cody Ridennoure, Rocky Ford School District R 2, USA "I would recommend ApplianSys, as they are customer-oriented"
As much as education authorities want to exploit the learning benefits offered by internet-connected classrooms, they have valid concerns about students being exposed to inappropriate content. In fact, in many countries, there is a legal requirement to prevent children from accessing specific content. Content filtering lets schools block types of content or individual domains, so students will never see them. EDUGATEBOX makes it easy to create group or school blocklists that can be shared with other schools, giving total control over which content they all allow access to. 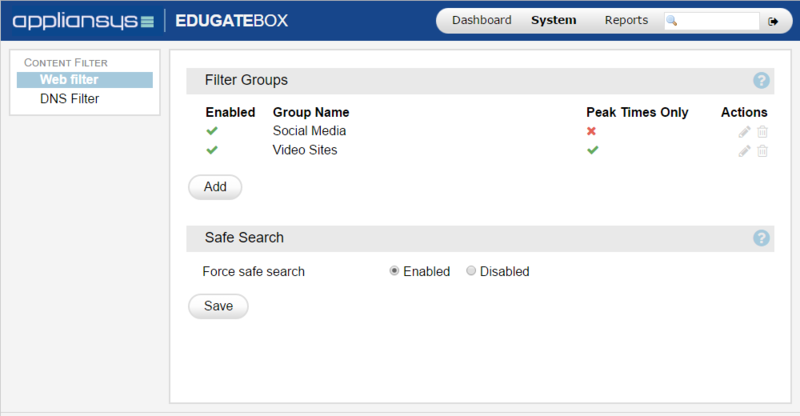 EDUGATEBOX filter settings also integrate with open-source and commercial ‘category lists’, so every school can immediately block Adult content or social networks from the moment they connect. And it’s easy for individual schools or groups to quickly refine their filtering – they simply add a URL or entire domain to a simple whitelist/blocklist to block or unblock content. As well as protecting students EDUGATEBOX can also restrict access to websites or domains at certain times to ease congested bandwidth, e.g. only allow access to social media sites outside school or lesson hours.